For almost as long as there has been an Internet people have complained about pop-up ads. Unless you’ve been living without network access, chances are you’ve encountered pop ups online. As the name suggests, these are ads that literally pop up in a window over the content you are reading, and they are usually there to sell you something. They can be intrusive, they can slow your computer down, and they’re annoying. While not all pop ups are ads, there is a surplus of borderline malicious pop ups waiting on the net to take over your screen. Coupled with distracting banner ads, pop ups can make your browsing experience frustrating and unproductive. Luckily, there is a solution: Pop up blockers and Ad Blockers like uBlock can stop these annoying ads before they reach your screen. Are All Pop Ups Bad? No. Pop-ups are simply a tool, a form of opening a window on your screen to show you information. Some can be helpful like pop-up content on your bank’s website, for example. Other examples of helpful pop-ups are login boxes, video players, or download prompts that you’ve legitimately requested. Still others exist in a grey area, like newsletter sign up requests or coupons on sites you’re visiting. Most commonly however, when people refer to pop ups, they’re talking about the annoying, intrusive, and sometimes scary pop up ad. The worst offenders are the ones that mimic critical security alerts, prompting you to contact “Microsoft” or “tech support” to solve an issue with your computer. They’re called scareware, because they attempt to scare you into action, downloading a solution that often just loads more adware or malware onto your computer. Another variant of popups are the ones that continually spawn new ones when closed, making it next to impossible to close them. These kinds of pop-ups are often found on the seedier parts of the Web, and are sometimes even resistant to pop up blockers. To minimize risk from these aggressive ads, try to stay on trusted sites, and don’t follow links you don’t recognize. The good news is that most pop-ups can be easily stopped from ever entering your screen in the first place. There are three main ways to block pop ups: Your browser itself, dedicated pop-up blockers, and ad blockers. Many modern browsers have some level of pop up blocking built in. The following browsers include a basic pop-up blocker- Chrome, Edge, Internet Explorer 11, Firefox, and Apple’s Safari. These in-browser pop up blockers have limited functionality however, and many of them don’t let you choose which pop ups to block and which to allow. For more control over pop ups than the standard Chrome pop up blocker, consider a dedicated pop up blocker or full ad blocking extension. For more control over the types of pop-ups blocked, you might consider a dedicated pop up blocker for the browser of your choice. All you have to do to find one is to search “pop-up blocker Chrome” or “best pop-up blocker Firefox” and find the one with the best reviews in its respective app store. For something even more robust, a full ad blocker is the best solution to your pop-up problems. An ad blocker blocks more than just pop ups. It also blocks those annoying banner ads, video ads, and more. Pop ups are requested and loaded in the same way as on-page ads, so ad blockers automatically stop most of them already. Why just block pop ups when you could block any unwanted advertising? If you don’t have an ad blocker installed why not give the uBlock pop up blocker and full-featured ad blocker a try? It’s free, easy to install on most browsers, and gives you full control over what ads and pop ups you see. While uBlock blocks all types of ads, sometimes pop ups can escape ad blockers when they’re first party, or hosted by the site itself. In many cases these are the less malicious types of pop ups, like newsletter requests or coupon codes. In any case, with an ad blocker like uBlock you can block elements of any kind, and in the same regard allow helpful pop-ups. Ad blockers may also not block malicious software that is pretending to be legitimate. As such, always be careful downloading free software from unknown sources, and be cautious of free torrent sites. The Difference Between an Ad Blocker and a Pop Up Blocker: Do I Need Both? Because most full-featured adblockers stop pop-ups as well as other types of online advertising, in most cases you won’t need both an ad blocker and a pop up blocker. The software that best pairs with an ad blocker like uBlock is quality anti-virus and malware detection software. While ad blockers curb the presence of malicious pop ups or advertisements from ever reaching your screen, you should always be cautious with cybersecurity. Even on the “safer” parts of the net, adware or spyware can lurk behind seemingly innocent free software downloads or email attachments. It’s always better to be safe than sorry when dealing with your personal information and privacy online. 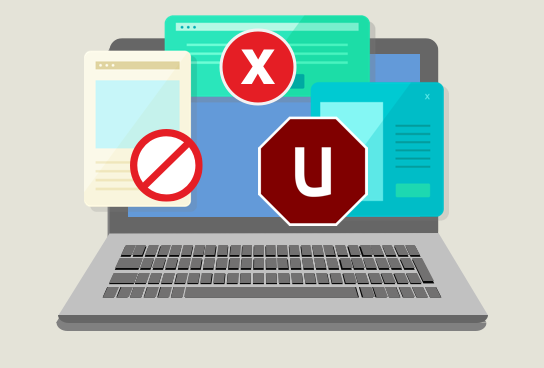 While not all pop-ups are dangerous, make sure you’ve covered your bases with solid antivirus software and a good pop up blocker or ad blocker. Internet security is not something to take lightly! Here at uBlock we’re dedicated to making your browsing experience as safe, fast, and irritation-free as possible.